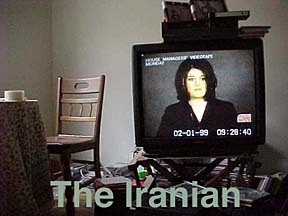 People in Iran, along with the rest of the world, heard all about what Monica Lewinsky and Bill Clinton did. They thought for a moment. Then they laughed and laughed. Mountains of reports and commentaries have made it more difficult to put together a clear picture of this affair. But it all started here: there was a man, there was a woman, there was an attraction and they did what human beings do when they are attracted to each other. The rest is, well, a matter of opinion. You can analyze it to death. But Clinton could have done much worse. Some guy on the radio said it best: "Clinton stained Monica's dress but Nixon stained the Constitution." My TV is on for much of the day. After I wake up around 8 and click my computer out of sleep, I turn on the radio for a couple of hours. Then I turn on the TV. But I only hear the sound because I have my back to it as I work on the computer. For the past few months all I've heard have been "Monica Lewinsky", "President Clinton", "Sexual relations", "The White House", "Republicans", "Impeachment", "CNN" and a few other sounds. The impeachment trial finally came to an end last month. And I was all prepared to document it. I took out my Sony digital camera and snapped away. Years from now, I will look at these pictures and remember the sounds that filled my room.